The North Pole season is going to its end. I had the pleasure to show the way “The Last Degree” for five British friends. 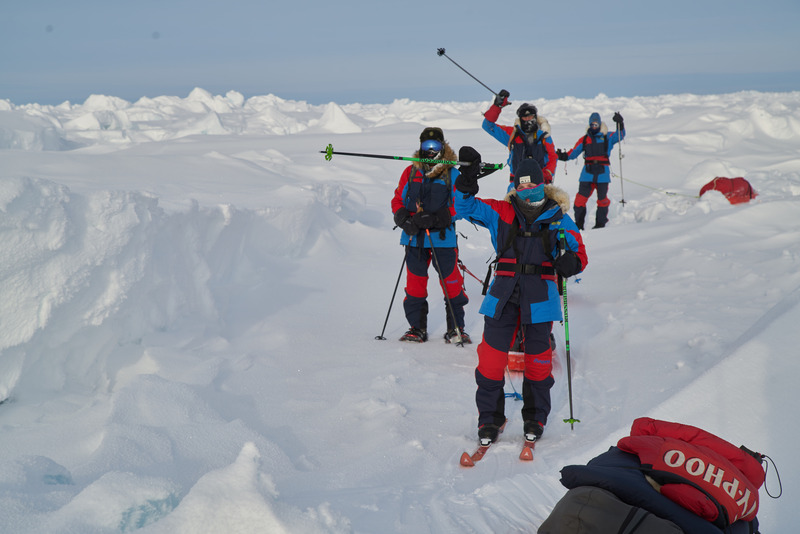 It was a very good year for us to walk the last 111 km to the North Pole. Good ice conditions with some open water, but good weather. Temperatur varying from -30 C to -10 C. Was set of by helicopter late evening 14th and started off the morning 15th of April. Well we started walking back one a half nautical mile to 88° 59´58” to be at the right position. Second Iceberg submitted. Huge stuff! Most spectacular on this years trip, was seeing lots of big icebergs. We visited two of them. I have never seen icebergs up there except one very close to the Canadian coast in 2011. We had a steady drift towards the Pole this year which helped on our distances up to more than 12 Nautical Miles in one day. Reaching the North Pole 89°59´59″ N 1630 European time the 20th of April. Barneo Ice-drift base was put up in record time, 10 days delayed. So impressed what VICAARD organization and their crew did in very short time, and a big thank you to them! Our home on the trip was the Bergans Wiglo which we just called the “Pleasure Dome”. No frostbites or acidenes and everyone happy 🙂 Thank you to a excellent team who did more than expected! Getting ready for todays walk. On the move across some of the challenges. Interference on the Arctic Ocean. Rushing setting up camp for the night. The Pleasure Dome is up. Bergans Wiglo tent. Two very good friends and buddy´s on the ocean. Pick-up time at the North Pole.